Information: Kappa, or traslated "river-child", are legendary water sprites found in Japanese folklore. They are depicted to have a humanoid form and to be about the size of a child. They have scaly, teptilian skin which range in color from green to yellow or blue. They have webbed feet and hands which and they inhabit the ponds and rivers of Japan. Problem: Kappa, being water sprites, have been blamed for the drownings and it was often said that kappa would lure people to the water pull them in. Even today people will blame kappa for drowning victims. 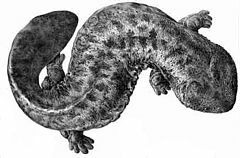 Assumptions: It has been suggested that the kappa legends are based on the Japanese giant salamader, which is an agressive salamander which can grow up to 1.5 meters (5ft) long. Consequences: The Japanese giant salamander is now and endangered species. This is very interesting and reminds me of the post I did on the Encantados, which are shapeshifters that also lore people into the river and drown them. The encantados are based off of river dolphins. The dolphins are endangered as well. Do you know if the salamanders are being slaughtered to prevent from drowning more people? I saw something about this on a Vanguard report on TV. The salamander was gigantic. To anyone who has not seen this beast throw it into Google Images and check it out it is definitely worth seeing. As for the Kappa I would personally like to see Jeremy Wade catch this river monster and prove or disprove the legend. Fish on Jeremy Wade Fish On!